A white-throated sparrow: Is its tweeting music to the ears other birds?Courtesy Dave Govoni (Va bene! 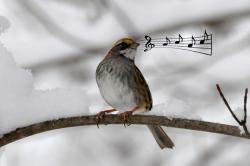 )Is birdsong music? Does the tweeting and chirping of our feathered friends elicit the same emotional response in them as one of Chopin’s nocturnes does in us? Do they serve the same purpose? These are questions that have long been argued in scientific circles and elsewhere. A new study published recently in Frontiers of Evolutionary Neuroscience shows some interesting results in how birds perceive birdsong. Researcher Sarah Earp and neuroscientist Donna Maney, both of Emory University looked at brain imaging data gathered from studies of human neural responses to music and compared them with similar data from birdsong studies. Some of the white-throated sparrows were given a boost of hormones (testosterone and estradiol) that made them all a-twitter and ready for love. When a male sparrow stepped up to the microphone and started serenading, the females showed a definite response. “We found that the same neural reward system is activated in female birds in the breeding state that are listening to male birdsong, and in people listening to music that they like,” said Sarah Earp. But what was music to the ears of the female sparrows was perceived by their male counterparts as discordant (and probably very annoying) noise from a rival suitor. An awkward third-wheel sort of deal, I suppose. The brain’s mesolimbic reward pathway has counterparts in both humans and birds. In humans it lies beneath the cerebrum and is involved in emotions, memory, and olfaction. A neurotransmitter called dopamine is produced within the brain’s limbic system and spreads along the limbic pathways to help regulate the brain’s reward and pleasure centers. The chemical messenger also governs movement and emotions. The study shows that not only does birdsong and music produce similar responses in corresponding brain regions linked to reward but also in areas thought to regulate emotions. And the response also seems to connected to social context in both birds and humans. *Rather than scary, I find composer Bernard Herrmann’s musical score used in Alfred Hitchcock’s PSYCHO very compelling – not sure what that response means. But it’s interesting to note that Herrmann’s music in the movie was also a big influence on record producer George Martin’s string arrangement for the Beatles’ melancholy ballad ELEANOR RIGBY.